House boats, explains a character in the new to DVD drama “Hide Away,” are for newly divorced men looking to scratch a long-simmering itch. It’s one of many oh, too obvious observations which nearly sink this somber tale. 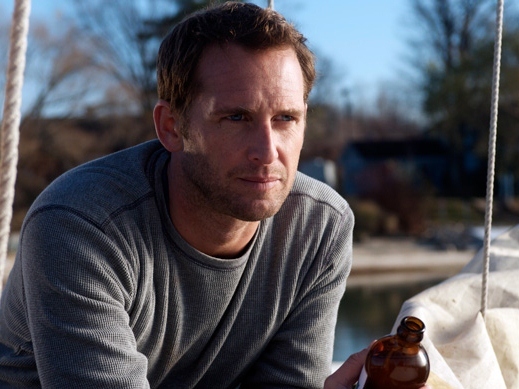 The always inventive Josh Lucas plays a man who buys a dilapidated house boat “as is” under cloudy circumstances. A singular flashback shows Lucas’ character, dubbed “The Young Mariner” in the credits, with a wife and children. He buys the boat by himself, though, and moves in even though the craft could generously be called a “fixer upper” if it stood on dry land. The Mariner eventually learns how to fix the boat’s clunky motor, sand the deck and charm the locals (including James Cromwell and Ayelet Zurer) by being completely inscrutable. Lucas’s role could have dissolved into farce if he didn’t calibrate his performance just right. He’s asked to stare blankly into the distance, drink alone repeatedly and look as if he’s about to have a complete emotional breakdown without actually committing to it. What’s missing is the sense of emotional surprise. You’ll chart every aspect of his mental recovery minutes before the film does. When Zurer’s character first appears on screen she practically screams, “I exist to heal the main character’s broken heart,” and she starts to do so without much prompting. You know she’s an old soul because she spends her time trying to quit smoking and trimming Bonsai trees. Sure, the film is set in a sleepy little hamlet on the water, but aren’t there a line of guys waiting to buy her a drink? Cromwell, Hollywood’s Old Salty, offers unblinking gravitas to firm up the film’s final act, but even he can’t pump life into story tropes as old as the sea. Where “Hide Away” excels is in depicting the slowly changing seasons as well as delivering intimate naval compositions. Director Chris Eyre (“Smoke Signals”) captures life on a boat with such precision and grace you’ll want to sign up – even if it means spending time with a near-suicidal guy like the Mariner. The film’s musical selections are also first rate, alternating between plaintive tracks and music just upbeat enough to offer a whiff of redemption. The DVD extras include “making of” footage which does more than let the film’s key players expound on their reasons for climbing aboard the rickety film vessel. The craftsmen behind the film, like the costume designer, describe how they used color – and the lack thereof – to mirror the main character’s somber inner journey.